So, last week I wrote up my Penny Penguin pattern and posted it. This was due to the fact that I had a bad wrist/hand situation and I wanted a fun and quick pattern to post. Well, the response was HUGE! I had tons of traffic, lots of shares on FB, and some Pinterest pins. Although my hand is feeling better, I decided to do another week of an earring/ applique pattern. 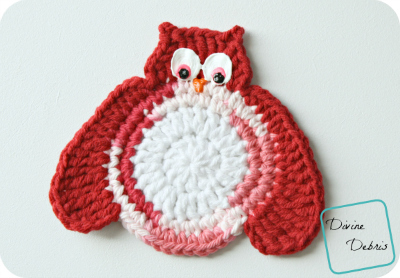 This week I decided to post one of my most popular patterns, the Olga Owls! 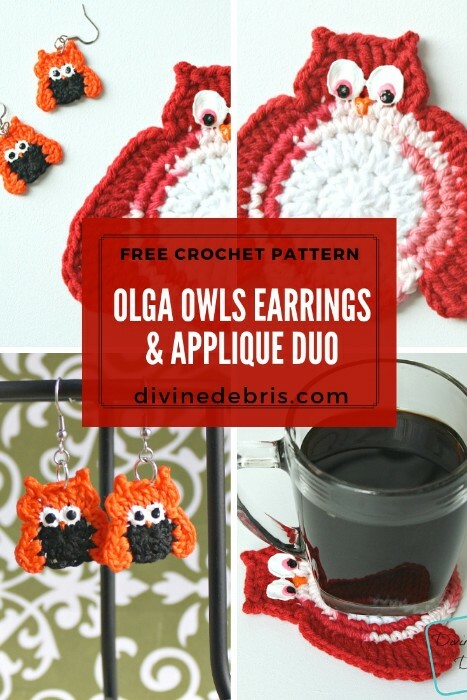 I love the Olga Owls and I’ve sold many pairs of these earrings, they always get some love. I hope you like them as much as I do and make many! 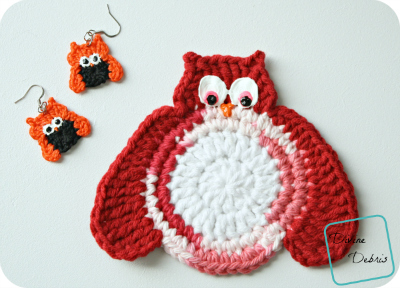 Again, I’ve included both an applique and earring pattern here. 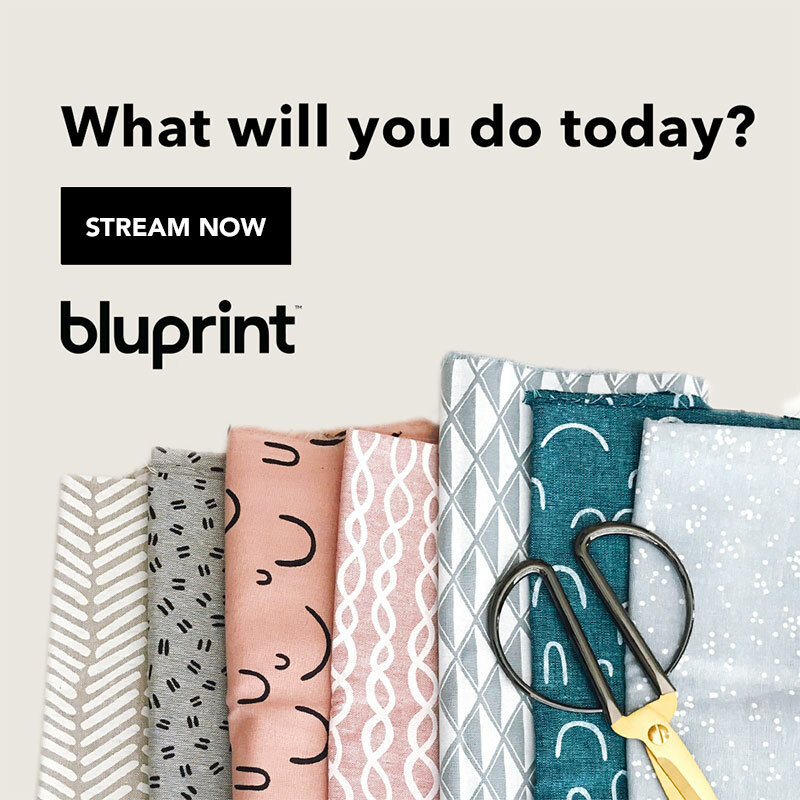 Perhaps I’m going to hold off on another round of earring/ applique posts because I’ve got some tentative plans to travel in a couple of months and I need to have posts saved up. 😀 Be sure to tell me what you’d like to see by dropping me a note in the contact form. 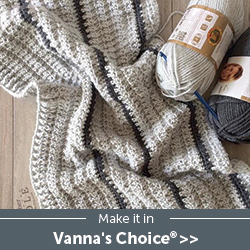 This pattern is worked in the round until the last row, which is work just part of the way around. Color A is the white, color b is variegated red/white, and color C is red (in the photos for coaster). 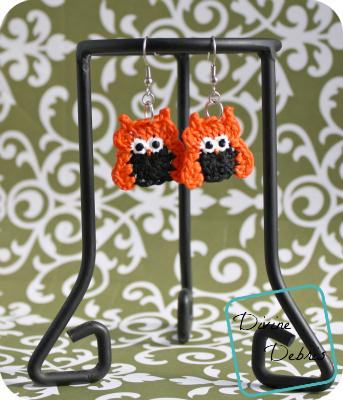 Earrings are color A is black and color B is orange. The body of the owl is created first and the last step are the eyes and beak. I don’t like feet on this pattern but if you do, I’d say use the ones I made for the Penny Penguins. For this applique/ coaster I had to do some wet blocking to get it to lay flat (darn increases caused it to wave a bit). Once it’s all dry and flat, I drew on some eyes with puffy paint. Be sure to tap your puffy paint, with the cap still on, on a flat surface tip down (this helps to reduce the air bubbles that pop and ruin pretty works). I hope you love these patterns as much as I do and I hope you share photos of them with me on Ravelry. I love seeing all your wonderful pictures! In other news, I finally have my asymmetrical shawl pattern being tested. It’s a long pattern and it took forever to finish because I ran out of yarn when I was working on it and had to wait for it to be ordered and then my hand did its thing and… yeah. I’m super excited and I hope it works out and looks great for everyone. Have I told you how nervous I get in testings? It’s enough to give me high blood pressure, I tell ya. 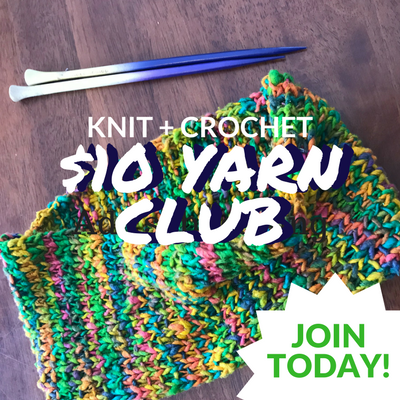 This post is linked to the Linky Ladies’ Community Link Party #32, Fiber Tuesdays #42. 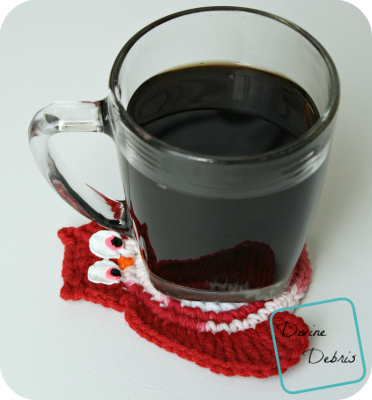 Thank you for sharing the owl coaster. I needed a gift in a pinch for a friend and this was perfect. Can’t wait to give it to her.